Knights of Creativity Spirit & Ale: Full Circle! The second button can make or break a shirt. Where did that come from? It's hard to believe, but it's been 10 years day since the last episode of Seinfeld aired. This "show about nothing" was always able to draw comedic absurdity from ordinary day-to-day events. Now one of the most successful TV shows ever, it really is a lesson in persistence. The reception to the pilot was very cool. In fact, not too many people gave it any hope of being continued at all. NBC eventually picked it us and the rest is TV history. I remember having a get-together at my parents house one time and we kids kept making Seinfeld references. My parents, it turns out, had never seen an episode. "You have to watch it!" we demanded. That night we all gathered around the TV, excitedly waiting for our parents first Seinfeld experience. To our shock, it was "The Contest" episode where George's mother throws her back out when she falls down after catching him doing "you know." When George says he'll never do it again, Jerry challenges him to a contest of self-denial, when he accepts, Elaine and Kramer want in on the action, or rather the lack of it. Needless to say, not a word was spoken for 30 minutes. 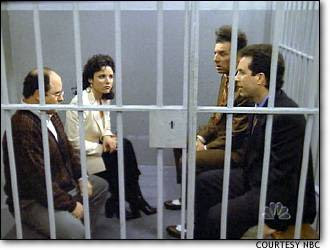 We didn't even laugh -- we were our own Seinfeld episode! Art imitating life or life imitating Seinfeld? As the year went on, we did catch my mom and dad making more and more Seinfeld quips in conversation. They turned into big fans -- though we never did discuss "The Contest." The final episode comes full circle with the same inane observation about buttons. The Second button to be exact and how it makes or breaks a shirt. In the Immortal Words of Chief Dan George, "Endeavor to be Persistent". Followed closely by, "Does she cause much excitement when you mount her?"